Investigators have lots of questions after a car crash in St. Petersburg killed a man who was resting at a bus stop. Santiago Carcamo, who was recovering from surgery, sat down near the intersection of 49th Street North and Disston Plaza. At about that same time, 78-year-old Louise Pequeno approached the area in a Honda CRV. After possibly brushing up against another SUV, Mr. Pequeno’s vehicle careened out of control. The vehicle picked up speed as it approached the sidewalk, because Mr. Pequeno apparently pressed the accelerator instead of the brake pedal. Both Mr. Carcamo and his 35-year-old grandson Gabriel Oliva were seriously injured in the wreck; Mr. Carcamo was later declared dead at a local hospital. Witnesses say that Mr. Pequeno was driving very carelessly, and investigators are mulling criminal charges. In a Tampa car crash, multiple restraint layers, not to mention a steel cocoon, protect vehicle occupants. But pedestrians are completely exposed to the risk of injury. Many times, as in the above story, they also have no opportunity to avoid the collision, because the tortfeasor (negligent driver) is simply approaching too quickly. That speed is another critical element. 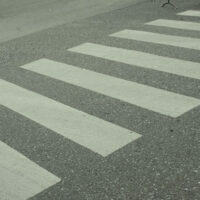 If the tortfeasor is travelling slower than 16mph, the pedestrian serious injury rate is only 10 percent. But the proportion jumps to 50 percent at 31mph and 75 percent at 39mph. Head Injuries: With no helmets or seat belts to guard them, both the sudden jarring motion and the trauma often cause serious brain injuries. Such wounds are incurable, but extensive physical therapy often relieves the symptoms. Broken Bones: Many pedestrian victims in Tampa are pinned between the tortfeasor’s vehicle and another solid object. The resulting pressure often crushes bones instead of merely breaking them. Exsanguination: Blood loss may be the most serious injury of all. By the time emergency responders get to the scene, many victims have lost so much blood that they are already perilously close to hypovolemic shock. Because of these and other serious injuries, victims in Tampa pedestrian collisions are usually entitled to compensation for their economic losses, such as medical bills, and their noneconomic losses, such as pain and suffering. According to cases like Palsgraf v. Long Island Railroad, the victim/plaintiff’s damages must be a foreseeable consequence of the tortfeasor’s action or inaction, or the tortfeasor is not liable for damages. In Palsgraf, a man dropped a package of fireworks on the ground while trying to board a train; the fireworks exploded, causing a large set of scales to topple over onto Ms. Palsgraf. The court later ruled that the railroad was not liable for her injuries, because they were not a foreseeable consequence of the railroad workers’ negligence. However, it is foreseeable that if a vehicle runs off the road, especially if that vehicle is accelerating at the time, that a pedestrian may be seriously injured. The wild card in the above story is the phantom hit-and-run driver. Investigators believe that SUV did not affect the outcome of the Tampa car crash, but if an insurance company lawyer can convince a jury otherwise, Mr. Carcamo’s family may not obtain compensation from Mr. Pequeno. In some cases, the foreseeability rule is expanded, so even victims who were not physically injured may be eligible for compensation for their emotional distress. Car crash victims are often entitled to substantial compensation. For a free consultation with an experienced personal injury attorney in Tampa, contact The Matassini Law Firm, P.A. Home and hospital visits are available.